On my recent visit to New York City I had the pleasure of being taken on a bar/restaurant tour by my friend Michelle who lives in the city. Like a lot of cities, its hard to know where the people go who “live” in that city. Typically a traveler ends up in a touristy area or an area that caters to business parks so if you are lucky you get a Chili’s or something similar to chill at. Michelle decided to head towards her regular “go to” area and maybe try out a few new bars she had heard about but not been to. I’m always up for experimental bar hopping, why not! The area we first went into is referred to the meatpacking district which I have always heard about but never been. This is much like many areas in old cities that have been re-purposed from their historical industrial ways to a new trendy area for those seeking unique environments and expertly made drinks. So the first bar we went to had only been open a couple of weeks but it had already created quite a buzz. Its on Gansevoort Street at 9th Ave and is called The Vinatta Project. They have an interesting wine bar set up that looks to be an elegant, grown up version of a do-it yourself bar. We were told this would eventually end up with whiskey in it! We sat at the bar and the bartender asked us what we’d like. What he meant was what kind of fresh fruit/herbs do you like and what is your favorite spirit. Well, I told him I don’t like mixed drinks but have had The Balvenie make me a drink that was delicious so if he could work out something with a Balvenie I’d give it a go. It was delicious! Tasted like dessert and I had a couple. Michelle had something with Gin and cucumbers, she said it was good but not as tasty as mine. So, two drinks, ready to hop! I’m at a loss at what we were going to go to but she brought up a dive bar that she likes to go to. 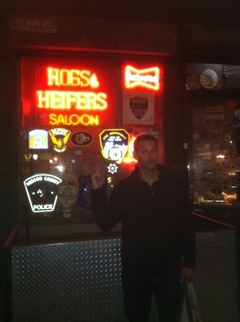 She wasn’t sure if I wanted to go but when she told me it was the real Coyote Ugly that inspired the movie, the real name is Hogs and Heifers, I was in! I love dive bars and surprisingly on a Wednesday night, plenty of NYC dwellers do also. The place was expectantly in overdrive with wall to wall people and shirtless bartenders who loved screaming through amplified megaphones. We had a ball! If you can’t have fun in a dive bar, you can’t have fun! Its at Washington Street and West 13th Street. The next night we kicked it off with two of her friends and headed to a Mexican bar, Tortilla Flats for margaritas and some food. This was a great neighborhood type bar that reminds you of college. It’s off Washington Street in the same area but at the corner of 12th (not little 12th, that is where the Biergarten is). From there we went on a walk, somewhere in the West Village but I could not tell you where. We popped in and out of some cool places and ended up at a place called Whitehall (which is new). We had some good drinks there and by then I was wanting anything BUT a mixed drink. We had been talking about wine so I said we should find a good wine bar. 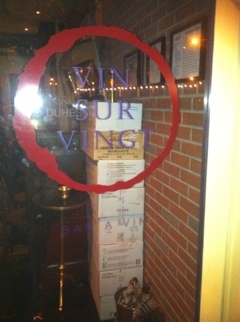 We found a place called Vin Sur Vingt, this place is awesome! Not only did the waitress, who I assumed was French, help us through the wine list she genuinely wanted to help us find something we would enjoy and kept us from haphazardly ordering. I also was hungry, and it was about 1 am or so, I do not think we had actually ate a meal so I ordered some meat and cheese appetizers and a sandwich. 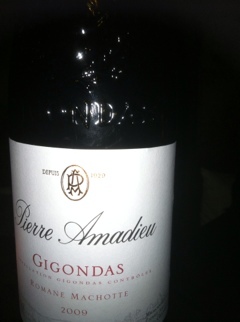 The food was awesome, the wine was awesome, I did not eat all the food but had a few glasses. This was probably the best find of the whole two night “bar hop” and I will plan to go there again on my return. If foursquare is accurate it is at 201 West 11th Street 7th Avenue. So, if you find yourself in NYC but with no friends who know the city, feel free to jump in on these places, you will be entertained and most likely find something you want to drink.